Filipino scientists have discovered evidence of a Hobbit-like humanoid that lived on Luzon Island as recently as 50,000 years ago. Teeth and bones of the newly named Homo Luzonensis were discovered in Callao Cave, in the northern town of Peñablanca in Cagayan province. The size of the bones suggests the newly discovered people were less than four feel tall, the second diminutive species discovered in Southeast Asia in recent times. The discovery undermines a long-held theory on how early humans — of which Homo sapiens is the only member still in existence — spread across the globe. Scientists have said the discovery makes the picture of early human existence “messier and a whole lot more interesting”. Varieties of human living 50,000 years ago included our own species, Homo sapiens, Neanderthals in Europe and western Asia, Denisovans in Siberia, and the diminutive Homo Floresiensis discovered in Indonesia in 2004. The latest discovery includes bones from at least three individuals alive in the late Pleistocene and was published in the journal Nature yesterday (Wednesday, April 10). “The discovery of Homo Luzonensis underscores the complexity of the evolution, dispersal and diversity of the genus Homo outside of Africa, and particularly in the islands of Southeast Asia, during the Pleistocene,” said the authors from the Museum of Natural History in Paris and the University of the Philippines. ALSO READ: How much evidence is enough to declare new species of human? Homo Erectus was thought to have been the only early human to leave Africa in the first wave, more than 1.5 million years ago. However, this theory now looks shaky in the light of the discoveries in Indonesia and the Philippines. As we have previously reported, evidence of meat being butchered by some form of humans in the Philippines stretches back 700,000 years. Armand Salvador Mijares and his team presented their findings during a press conference at the University of the Philippines Diliman today. They deduced that the Hobbits were bipedal, but didn’t necessarily have an erect posture. “The problem is we only have the foot bone. We did compare it with other primates. And definitely it’s a fully bipedal creature. It can walk,” Mr Mijares said. “Maybe it has better climbing capability than homo sapiens,” he added. Mr Mijares said that they discovered the first bone in 2007 but labelled it as that of a “small-bodied H. sapiens”. Further pieces of evidence dug up in 2011 and 2015 backed the existence of the Homo Luzonensis, and further proved that the creatures were small-bodied. “What we can say is that they’re small-bodied, how small we don’t know. Small because their teeth are very small,” he said. The fossils are 50,000-67,000 years old, which means Homo Luzonensis predate the Homo Sapiens found on Palawan, estimated to be 30,000-40,000 years old. 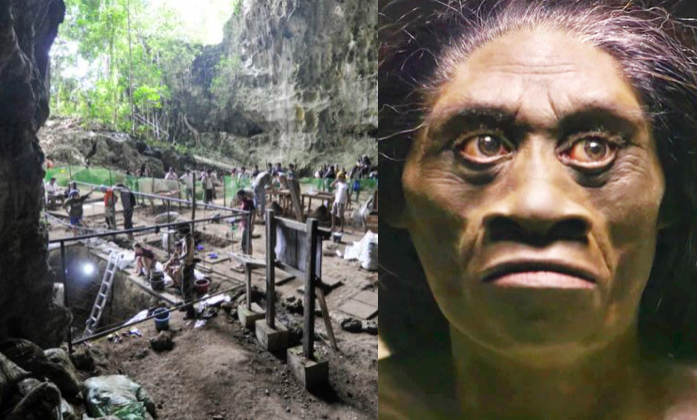 This would make the Hobbits the earliest human remains found in the Philippines. Mr Mijares said that they may have overlapped with modern humans at some point. “They might have coexisted. But we don’t know if they had direct contact,” he said. Although their remains were found in a cave, they didn’t live, or die, there. In fact, Mr Mijares said that there wasn’t even a cave entrance at the time of the Hobbits. “We need to do more work. Digging this time period takes a long time, and perseverance, and patience,” Mr Mijares said. “It’s just a start of what we discovered. We will discover more, hopefully soon”. very interesting find, knowing the Europeans and Americans were the major contributors of human anthropology, we have Asian findings right now. Haha I have two Flippos cleaning my HK apartment twice a week. Can historic map prove Scarborough Shoal belongs to the Philippines?